have you picked up something for him yet? i'm sure you've all attempted to go christmas shopping but got distracted and started to shop for yourself (don't worry...i do it ALL the time). i was doing some shopping online and thought i'd help save you some time and distraction by giving you some gift ideas. if the gift guide doesn't quite suite the man/men in your life hop over to mr. porter (it's the mens version of net-a-porter). they have everything from accessories to gadgets to clothing...you name it...they got it! Great list, Annie! I know my hubs will love ANY of these items here. you just give such a nice ideas for my boyfriend, he is french, so its very difficult to make him happy about gifts :) besos! Shopping for guys is a lot tougher than it seems. Great picks! You caught me, I've been totally distracted while shopping. 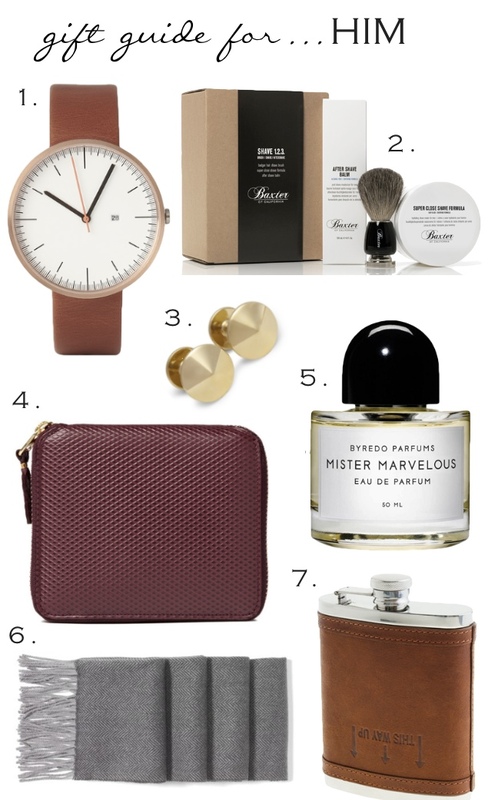 Well, my husband wants a leather cuff for Christmas, so I'm off to Mr. Porter to see what they've got. Thanks for the tip and wonderful roundup!